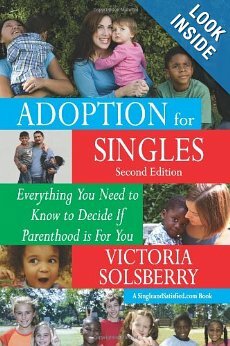 This sounds so Wayne’s World, but I interviewed my dad’s cousin about her new book that’s out called “Adoption for Singles.” I can’t wait to read it! It’s no secret I have a soft spot for kids, and it’s so sad to me that there are so many of them without parents. If I could, I’d adopt them all myself! Kerrie: What is your writing process? Vicki: My writing process is probably the opposite of what they teach in writing programs around the country, because I'm a horrible editor! Once I put my thoughts into writing, it's very difficult for me to change those words, for some reason. So I do my research, all my reading, and then I think about it for days and weeks. Then I go to the library or a coffee shop armed with my laptop and snacks, and I crank it out, almost without stopping. For instance, I wrote the first chapter of my book in one afternoon at the library, with some scratch-outs and phrase rewrites, but when I was done, it was done. At that point I'm totally exhausted and need a glass of wine and dinner. I've always been an all-at-once writer, even in high school and college. I think it's because I have ADHD and I'm unable to write in bits and pieces because I need to be totally immersed in that world for hours to make it all come together. So I've always prepared mentally, and then I've sat down and started writing with the whole outline in my head. I come up for air some time later with a more coherent and organized paper than I would if I wrote over the course of weeks. In the mental health field we call it "hyperfocus" and it works for me! Kerrie: Did you keep your "day job" while writing? Vicki: Absolutely. I had to to survive financially. So most of my writing was done on Saturdays because I'm too tired in the evening after a full day at work. I did do some of the research in the evenings -- for instance, the Appendix of all of the countries in the world and their policies on adopting to American singles (100+ pages) was done at night because I didn't really have to think! I was scanning for certain facts and when I found them, they went into a format that I had designed. I could even listen to the television when I was working on the directory! One of the chapters of the book is a compilation of Questions and Answers from adoptive parents and adoption professionals I even got the Executive Director of The Dave Thomas Foundation for Adoption, which felt like quite a coup for me! After an initial telephone call, the chapter was written by email, where I would send questions and the interviewees would answer, and then I'd follow up. It was great because I didn't have to record interviews and the interviewees were able to edit their words and say exactly what they wanted to say. It saved me a ton of work! Kerrie: How did the idea for this book come to you? Vicki: In addition to my training as a clinical social worker, I've been trained as a life coach. Several years ago I decided to focus on singles, not so much for dating support, but for support in all of the other areas of a successful single person's life. I knew that I needed money to pursue setting up a web community and hit on the idea of writing a short -- 40 pages or so -- electronic book about adoption to sell to make money for the new venture. But when I started researching the topic, I found that it was much more complicated that I had imagined, and that the adoption world is big and ever-changing. Every time I sat down to think about it, I thought of a new area that I thought needed to be addressed, because they were issues that I would want to know about if I were adopting or thinking about adoption. So the 40-page book turned into the book that ate New York, and I had to limit it to 288 pages with free white papers that can be downloaded from the web site. That way it would be less expensive for me to publish, and yet the additional forms that I designed to help with the adoption process, and other information about agencies, etc., would come with the book. And the electronic version is just one way to buy the book -- along the way I decided to actually print it! Although I initially decided to write the book to make some money, it soon became clear to me that there are millions of children out there who need a parent. Here in the U.S., 129,000 kids' parents have had their parental rights terminated, and are waiting for parents. And there are 5 million orphans in Ethiopia alone! So it has become a crusade of sorts because I became aware of all of the children who are suffering, and I also found out that you can adopt for free if you're fairly open to all kinds of kids. Kerrie: How long did it take you to write? Vicki: It took about a year and a half, not because I wrote for hours each week, but because life got in the way and sometimes I would go for several months without writing at all. If I had been able to stop working and do my research and writing every day, I think it would have take several months to finish. Then the production process has been about 6 months long -- finding someone to do the graphics on the cover I designed and to format the text and get it digitally ready for printing (www.Accurance.com), proofreading many times, publishing and getting the ISBN number, having the cover and copyright page redone to reflect the ISBN number and publishing date. And setting up the book's web site so that it can be sold. I've learned an enormous amount about the production process, and I think that it will be much faster next time because I won't make the same mistakes! Kerrie: What is the release date, a Web site, any other publicity information? Vicki: The book is out right now (yeah!!!) and for sale at www.adoptionforsinglesbook.com. The book is a little more expensive than standard trade size paperbacks that you would find in your bookstore because it is a Print-on-Demand book. For those of you who aren't familiar with that process, it means that when you self-publish, as I did, you don't need to sign a contract and buy thousands of dollars worth of books that you sell and distribute yourself. I used www.lulu.com , a POD company that prints each book as it is ordered, charges a commission on each sale, and then sends me the royalty that I have put on each book. They make no money unless you sell your book and charge nothing more than that 20% commission, so it's quite a deal! They also offer a Distribution Package and submit the book to Amazon and Barnes and Noble for sale on their web sites. I had to price the book higher than I would like because Amazon and Barnes and Noble make 50% right off the top when a book is sold on their web sites. So I priced the book at $29.95 because the price has to be the same across all sales venues, and because A and B&N take $14.98. Anything lower would have meant that I would have to pay people to buy the book! But, I think that if I were considering adoption, as busy as I am, I would be willing to pay someone $30 to do all of the research for me. Vicki, I quite agree! Adoption is such a scary thought to so many people that they need a resource to guide them through the process. And I’m sure many singles don’t even think they have a chance at adoption. If they would just realize that (1) they don’t have to be perfect to adopt, (2) they don’t have to be rich to adopt and (3) there are many ages of kids to adopt that are just sitting in the System … they could be on their way to a whole new life as Parent! Thanks for writing this book! Blog readers: please forward this post to anyone you know who is looking at adoption!